There are plenty of chefs toying with far-flung flavors in New York, but few have flawlessly captured the true taste of distant cultures. Once in a while, though, an outsider manages to find a way in, learning to cook like a native son. Andy Ricker, raised on ski-town grub in Vermont, flipped for Thai food years back, as a rudderless vagabond wandering across Southeast Asia (working on boats in the Pacific). 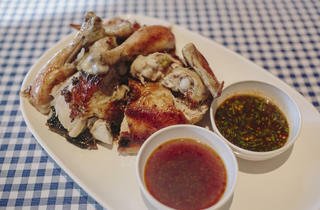 His immersion started in Chiang Mai, where great local cooks took him under their wings. Year after year he returned to the city to build a repertoire of authentic Thai tastes with a scholar’s devotion to detail. His first restaurant, the original Pok Pok, opened in Portland, Oregon in 2005 as a takeout shack, serving Thai-style barbecue chicken and mortar-and-pestle papaya salads. 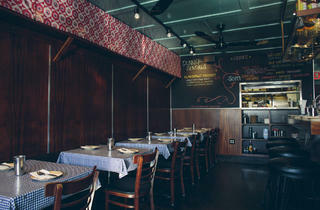 It gained momentum organically, evolving over the years into one of the country’s top spots for a serious Thai feast. 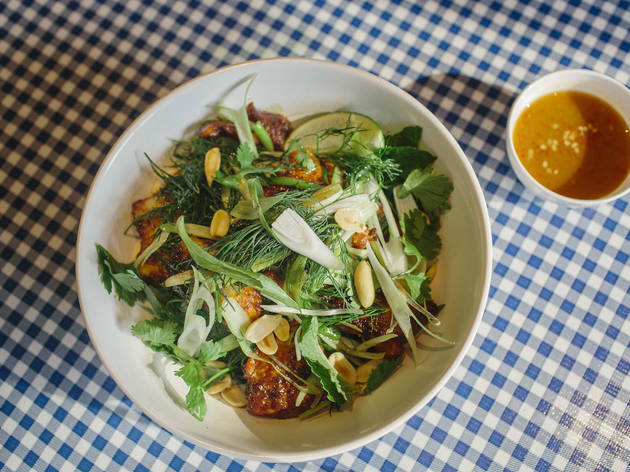 Recently, Ricker exported the concept east to New York, opening a small wing shop on the Lower East Side, followed by a full-fledged replica of the Portland Pok Pok on the Brooklyn waterfront, featuring the same intense flavors and honky-tonk vibe. 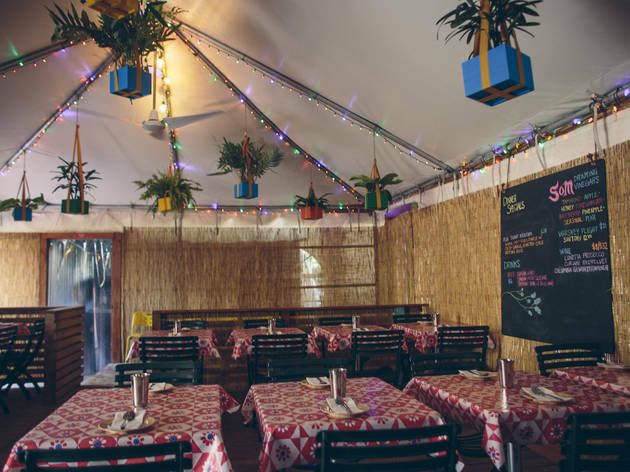 The new spot, like the original, replicates the indigenous dives where Ricker’s Thai food education began, with a tented dining room out back festooned with a jungle of dangling plants, colorful oilcloths on the tables and secondhand seats. 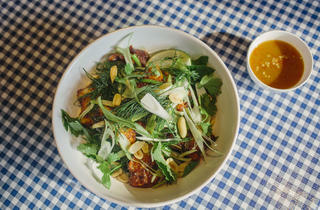 Ricker is a rare out-of-town chef who hasn’t jacked up prices in the move to New York—nothing on the menu is over $16. The nightly queue for his great-value food begins before the restaurant opens at 6pm. By 7, there may already be a two-hour wait. 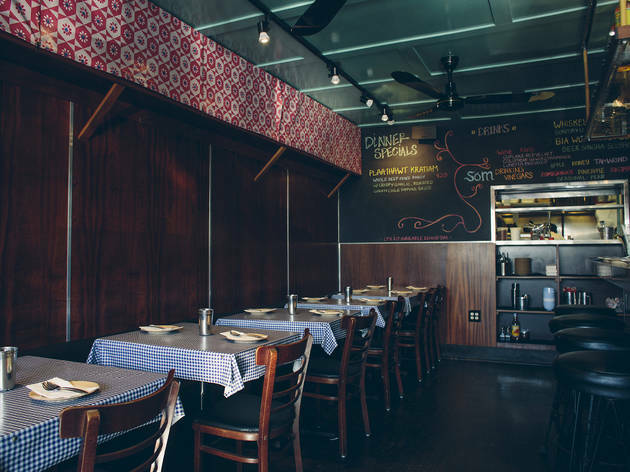 What separates Pok Pok from other cultish Thai restaurants, like Sripraphai in Queens, is the curatorial role of its minutiae-mad chef. Ricker, who flavors the water here with pandanus leaf and presses his own coconuts for cream, focuses mostly on the funky fare of northern Thailand. His long menu—concise by Thai restaurant standards—is a collection of dishes he loves, so it’s all but impossible to have a bad meal. You can, though, have an unbalanced one, ordering four types of noodles, say, and five plates of pork. The genial waitstaff could be more helpful on that front, but still, this is a menu without any duds. 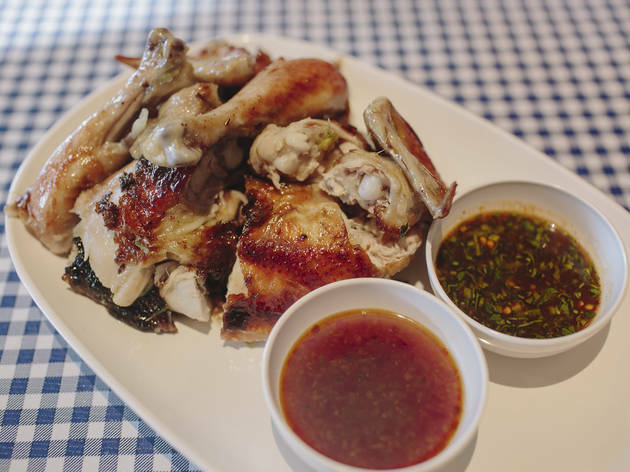 For starters, try the barbecued hen—it’s where Pok Pok began—cooked on an upright rotisserie imported by Ricker from across the Pacific. It’s a beautifully burnished and terrifically succulent bird, but no match in the public consciousness for the chef’s TV-star wings (first featured on Diners, Drive-Ins and Dives in 2009). 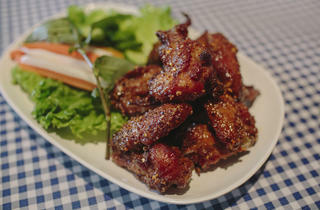 Those fish-sauced wings—spicy, sticky, finger-licking in the extreme—are the top sellers on both coasts. 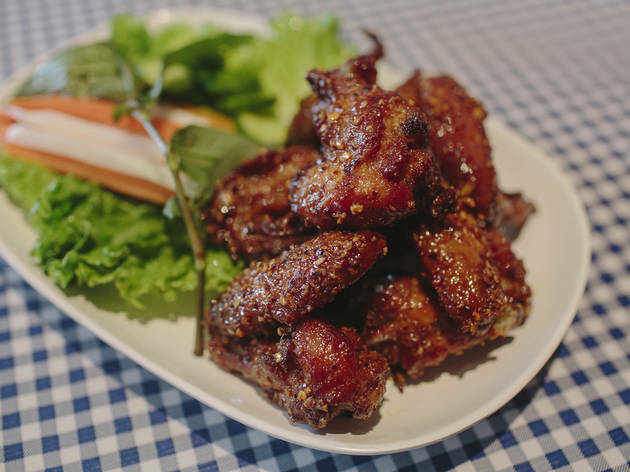 Order them if you must—they are pretty irresistible (and available, also, at Pok Pok Wing in Manhattan)—but there are much more interesting things on the menu. Contrary to popular belief, not all Thai cooking rocks the Scoville scale. 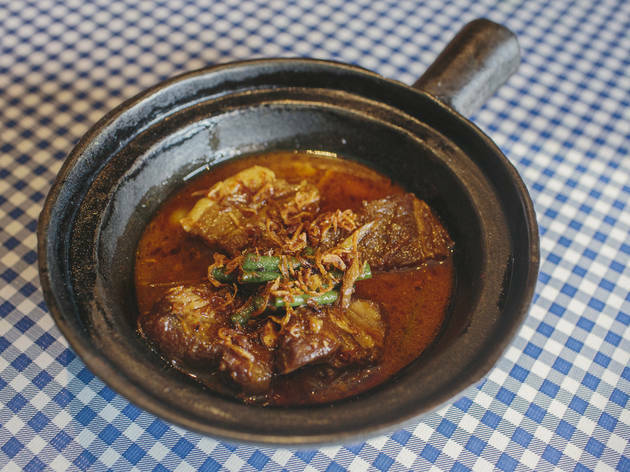 Ricker highlights a host of surprisingly mild northern-Thai dishes, including a delicious sweet-and-sour Burmese-inflected pork curry—kaeng hung leh—flavored with tamarind and palm sugar. His khao soi, the beloved meal-in-a-bowl from Chiang Mai—chicken noodle soup delicately spiced with yellow curry and topped with fried noodles for crunch—is accompanied here, as there, with raw shallots and pickled mustard greens. Ricker goes the extra mile to get the condiments right. 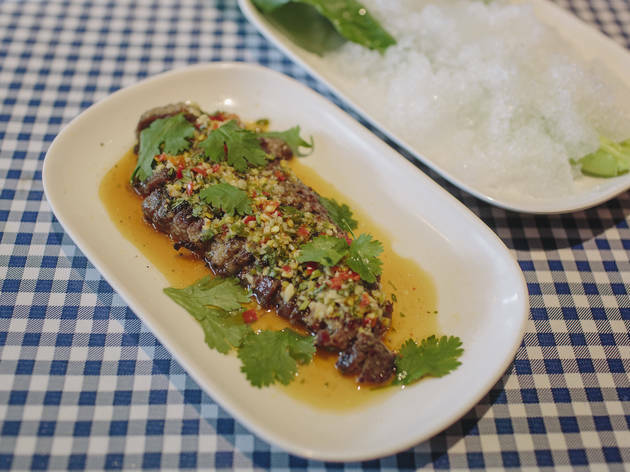 He accompanies the room-temperature pork neck slices in his “Thai drinking food,” muu kham waan—as it’s described on the informative menu—with raw mustard greens delivered under a crunch-intensifying heap of crushed ice. His extra-rustic house-cured pork sausage comes with even more crudités, with crispy cabbage and long beans for dipping into green chili naam phrik num (a medium-spicy chutney of sorts). Ricker, who won a James Beard Award last year, has been known to insist he’s not really a chef. If you’ve traveled as widely as he has, and tasted this food at the source, his cooking will certainly seem more like anthropology—the laap with diced catfish in pulverized rice is just as spicy as it should be (hot but not incendiary), the hoi thawt (a fried crêpe filled with plump mussels) as crinkly on the edges as the best night-market versions. 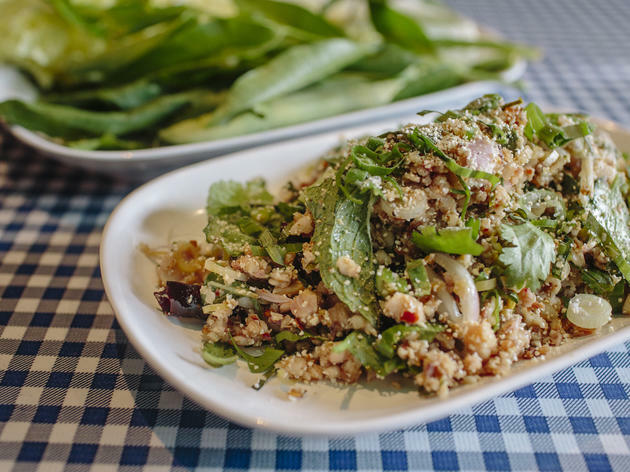 Even his cha ca “La Vong,” a geographic anomaly from across the border in Vietnam, is a spot-on reproduction of the original dish, a cult favorite from Hanoi featuring spiced catfish, rice vermicelli, and generous handfuls of fresh dill and mint. The desserts here are as much cultural artifacts as everything else. The ice cream “sandwich”—a hot-dog bun filled with coconut ice cream, peanuts and chocolate sauce—isn’t a cute idea from the chef, but a copy of a popular Thai street snack. And so is the unusually mellow durian custard on sweet sticky rice. Beyond using high-quality ingredients, Ricker has resisted the chefly impulse to try to improve on this food—to add Western flourishes to the Eastern originals. The chef himself would never claim authenticity, but there’s no arguing that he hasn’t beautifully evoked the spirit of a country he loves. Drink this: Ricker has imported classic drinks from Thailand, including sour-sweet fruit-flavored drinking vinegars, available on ice ($4) or mixed into cocktails. There’s also “jelly beer,” your choice of Chang or Singha ($5) chilled down using an ice-filled contraption fitted with a windshield wiper engine so that the liquid in the bottle turns to slush (as it’s sometimes served in sweltering Thailand). Try the refreshing and potent kafae boraan “grown up style” ($10), a brandy-spiked Thai iced coffee with sweetened condensed milk. 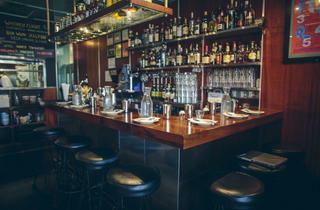 Sit here: The tiny front dining room is the coziest spot, best suited to tables for two. The semioutdoor tented dining room in back, fenced in with bamboo, is the most atmospheric place to eat, and the best spot for big groups. 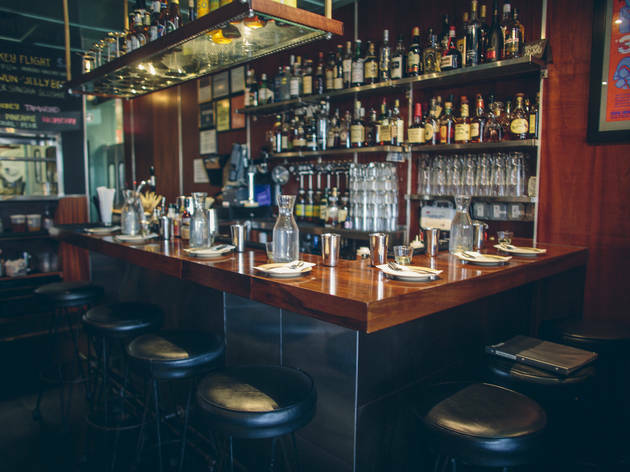 Conversation piece: Along with East and West Coast Pok Poks, Andy Ricker’s restaurant empire includes Portland venues Ping (a Pan-Asian izakaya) and Whiskey Soda Lounge (a Thai dive bar). 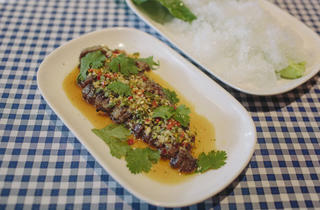 A new concept, focused on Thai rice dishes, is also in the works for the chef’s hometown, along with his debut cookbook, scheduled for a 2013 release. Everyone seems to love this place so I don't think you should listen to my opinion of this place at all, because honestly it is just not for me. I don't think I'm that picky, but I do have two restrictions, no meat and nothing spicy. And this place has almost nothing that fulfills those requirements. From what I understand that is very authentic and legit, so awesome, but traveling in Thailand would probably not be for me! haha They also put I think pandan in the water? Which gave it a weird after taste that I thought made it not very refreshing. Also, a lot of the stuff on the menu is "designed for sharing" which I sometimes think is just a way to get you to buy more stuff. I did have a basil lemonade cocktail which was very good! And our server was wonderful with our large party! I came here on a Saturday with my roommate, and they told us there would be about a 15 minute wait for the bar (score for a Saturday). We put our names in, they said they would text us and we could go grab a drink at Hop Shop while we wait. We waited about 15 minutes and we got a text that our seats were ready. We knew we wanted the wings (delicious), some type of noodle dish, and the pork belly. We also got the sticky rice, traditional rice and several cocktails. Both drinks we had were delicious and the bartender was very helpful in deciding which drinks we were the best choices for us. We enjoyed everything we had eaten, and I felt like the service was really great. I would definitely go back again, and the wings are a must have! 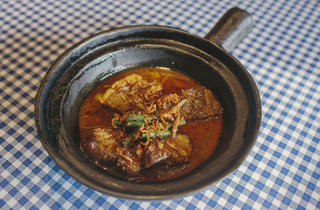 For everything I heard and read about Pok Pok, I expected better. I'm not saying it was bad by any means, and many I didn't order the right dishe, but between the food and the wait, I'm not rushing to go back. This is the best thai I've had in New York. I love spicy food and can handle it all, and this place did not disappoint. Our table of eight tried just about everything. The wings were perfect and the fish pretty much melted my face off—in a good way. I absolutely loved the cocktails, so much yummy coconut milk, so soothing when you're eating dishes filled with numbing peppers. 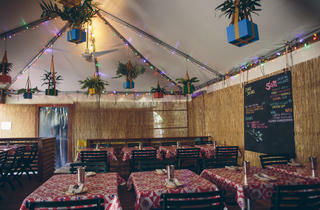 Pok Pok had authentic flavor and spices! I did indeed feel like I was food at a place in northern Thailand. I highly recommend you try the specials. I had the pennywort salad. It was so tasty and refreshing. 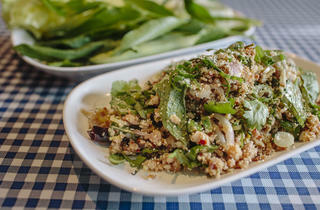 We also ordered the minced pork salad, fish sauce wings, chiang mai sausage, and vermicelli noodles with curry broth. I hear it is not as good as the Portland Pok Pok, but I enjoyed it just as much. My favorites were the pennywort salad and the vermicelli noodles. I definitely ventured outside my comfort zone and didn't order papaya salad! For dessert, we ordered the bourdon milk shake and it was so yummy. Dinner is pricey, but how else are you going to get fresh, spicy, authentic flavors without hopping on a plane?! Muu kham wan is the 3rd picture, not the 6th.